Come home to your own slice of paradise at Portopiccolo. With an unparalleled selection of waterfront properties to buy and rent across penthouses, villas, terrace homes and village houses, your North Adriatic retreat is waiting for you today. A secret haven on the Gulf of Trieste. A secluded retreat, built around the watchwords of style, grace and elegance. And a living community, just waiting to be explored. This is Portopiccolo, northeastern Italy’s most exclusive waterfront community, and you’re invited to become a part of it. But this is more than a seaside sanctuary. Portopiccolo’s streets may be calm and car-free, but they hide a surfeit of things to do and see. Elegant boutiques and ateliers. Chances to see and purchase the latest in contemporary fashion, design and art. And, of course, the very finest examples of Italian cuisine. All set on a secluded stretch of truly unspoilt coastline. Those sea views are Portopiccolo’s greatest asset. Which is why every residence in our community, from the waterfront village houses to the spacious villas and penthouses, is designed to give you an unbroken panorama of the bay. Inside, you’ll find care has been taken in every detail: handpicked furnishings, natural materials and intelligent design all come together to create some the most sublime examples of luxury residences anywhere in Italy. And with a range of property to buy and let still available, you too can call Portopiccolo home. Sheltered by the protective embrace of the majestic cliffs known as falesie, and with a one-of-a-kind location in the beautiful Duino Cliffs Nature Reserve, Portopiccolo is at once modern and traditional, technologically advanced yet perfectly in sync with its surroundings. With an accessible location on the Gulf of Trieste, making your way to Portopiccolo couldn’t be easier. Trieste’s airport is just 15 minutes away by car, while an hours’ drive can take you the airports of Venice, Treviso, Klagenfurt or Ljubljana. Even a few hours in Portopiccolo is enough to make an impression that lasts a lifetime. And with a wide array of restaurants, bars, shops and more to explore, you may find yourself returning sooner than you think. 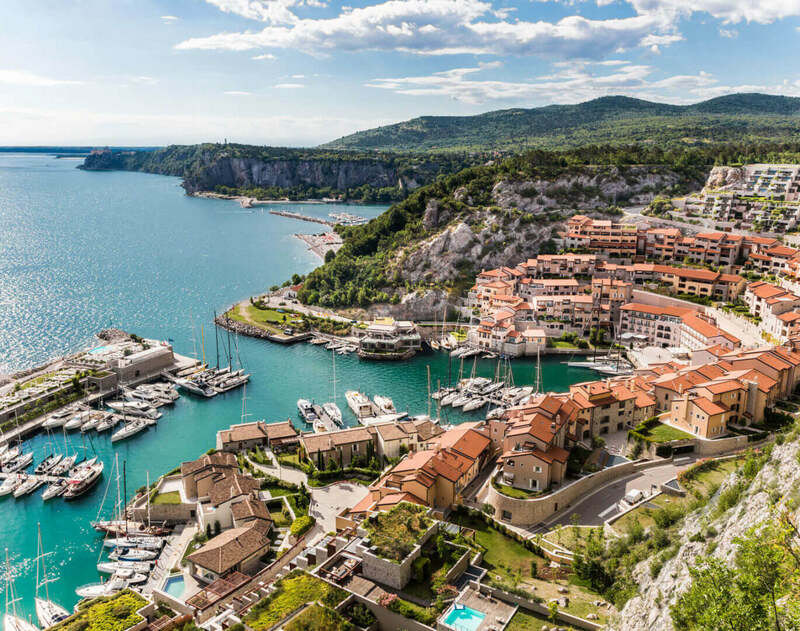 Hidden away on the eastern coast of the Gulf of Trieste, Portopiccolo’s stunning location makes it the perfect base for trips across northern Italy, as well as to Croatia, Slovenia, Austria or even further afield. Imagine a quiet beach of white pebbles, crystal clear blue water and the best cuisine of our country. With an apartment or a house in Portopiccolo, this Italian paradise will be yours.